Hopefully our Hoboken Public Library Resident Cardholders have already been enjoying movies, TV shows, music, and audiobooks from Hoopla, but if you haven’t yet checked it out, do so today! I listed a few of my highlights for Hoopla’s debut already. For this post I thought I’d look at some of the great international selections you can check out from Hoopla. Of course you can find hit American movies like The Big Lebowski or listen to artists like Jay-Z, Delta Rae and of course Hoboken’s own Sinatra, but I’m also having lots of fun enjoying a plethora of International choices available from Hoopla. In the honor of the eight free checkouts per month you can have from Hoopla, here are eight international choices I have enjoyed. The French period drama, Les Adieux à la Reine (Farewell My Queen), is set just before and after the fall of the Bastille at the Palace of Versailles. It is based on the best-selling novel by Chantal Thomas (the print book is available from HPL). Léa Seydoux stars as Sidonie, one of Marie Antoinette’s servants whose main task is to read novels, fashion magazines, and other publications to her monarch. Sidonie is clearly in love with the Queen, but Marie Antoinette though giving her special favors and confidences at times also seems cold and aloof at others. Definitely borrow Farewell My Queen if you are a Francophile or a fan of Sofia Coppola’s Marie Antoinette for another distinctive depiction of the Queen, masterfully acted by Diane Kruger. The Surreal Tragic Romance, Mood Indigo is a French movie based on Boris Vian’s 1947 novel Froth on the Daydream. It stars Romain Duris and Audrey Tautou, who I have been a fan of since another quirky French film, Amelie. Mood Indigo includes a resident mouse played by a man in a mouse suit, a piano that when played creates cocktails themed to the music, and other unique visuals. 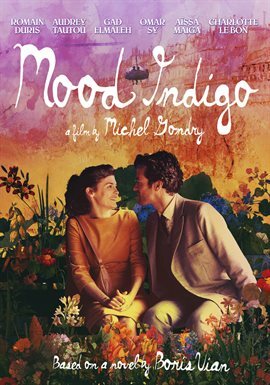 Mood Indigo was co-written and directed by Michel Gondry, who was also responsible for the eccentric American film, Eternal Sunshine of the Spotless Mind and several of Bjork’s music videos. Fans of Gondry’s work should be captivated by Mood Indigo. 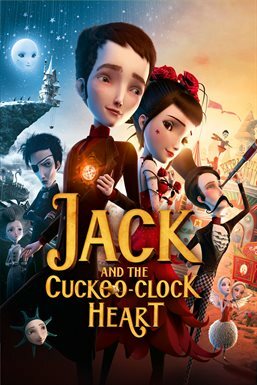 Jack and The Cuckoo Clock Heart is based on the book La Mécanique du Cœur by Mathias Malzieu and concept album by his band Dionysos. The music for the movie is also provided by Dionysos and it proves a cooler sound track than many similar animated movies. The version available from Hoopla has been dubbed in English, but is set in Scotland, France, and Spain. What I enjoyed about the movie is though it is darkly whimsical and could be described as Steampunk, it does both in a decidedly unique French way so is different from American Steampunk and spooky playful American animations like those of Tim Burton. The story’s beautiful, but sad ending could provide an opportunity to discuss with older children about grieving and loss. You can also borrow the CD La Mécanique Du Coeur by Dionysos from Hoopla. If you and the kids in your life enjoyed Monsters, Inc., you should also find this Spanish/French coproduction a delight. Although it was originally animated in Spanish, the English dubbing synchronization is excellent. 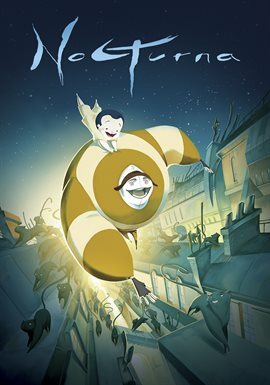 Nocturna tells the story of a young orphan named Tim who is afraid of the dark and only can sleep through the night because of his special star. One evening his star disappears and when he goes looking for her he encounters the cat shepherd, who introduces him to the world of Nocturna where whimsical humanoid creatures orchestrate everything at night from the tangles children get in their hair to the banging of the window panes. The traditional style drawn animation has a muted color palate of mostly browns and golds and a unique visual style. 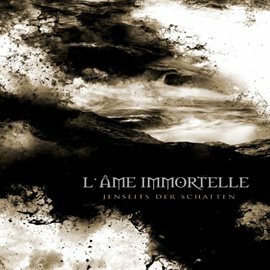 I mentioned in my last Hoopla related post about being excited to download Austrian Darkwave act, L’Ame Immortelle’s latest album. Like their earlier recordings, I enjoyed it very much and listened to about a dozen times during the seven days I had it checked out. Their music features a juxtaposition of electronic music with gritty male vocals with more atmospheric cabaret or almost operaesque female vocals. This seems a fitting style for their many songs of love and longing sung in German and English. You can borrow several of the recordings on Hoopla; I especially like Jenseits der Schatten featuring the amazing track “Tiefster Winter”, which is for me one of those songs I enjoy listening to over and over again. Fans of Tim Burton, Roman Dirge’s Lenore graphic novels, and Invader Zim, will find charm in Ruby Gloom, a Canadian Animated show. Ruby Gloom looks like a gothic Raggedy Anne and always stays positive despite living in a gloomy old mansion with her black cat and a raven named Poe. This whimsically spooky show isn’t too scary for kids, but will be especially appealing to tweens. 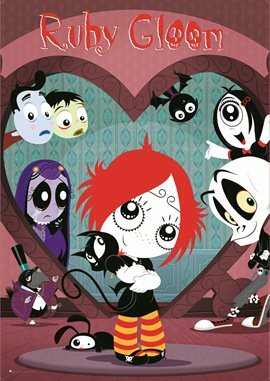 I fell in love with Ruby Gloom when I found a clip online so was thrilled to find all three seasons available on Hoopla. 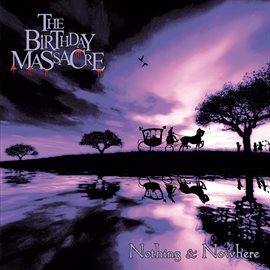 For those who want a bit more whimsical darkness from our Northern neighbor this time in musical form, listening to Canadian band Birthday Massacre is a must. One of my favorite bands they have a goth/emo look, but to me a wider appeal beyond either of those genres. Their music has a distinctive electronic sound and exclusively use violet tinted imagery with reoccurring motifs like rabbits on their artwork (the founding members met getting fine art degrees) gives them a dark fairy tale like feel. You can listen to a variety of their albums from Hoopla including their first Nothing and Nowhere and latest Superstition. So check them out; I hope you love them as much as I do. If you are a fan of Anime (Japanese Animation), which is often geared to an adult audience, Hoopla has a variety of movies and TV shows to choose from. But besides anime, there are several Japanese cinematic gems to check out with Hoopla. 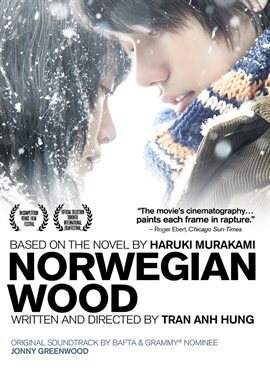 Norwegian Wood (Noruwei No Mori) is based on Haruki Murakami’s classic coming of age tale about a teenager, Toru Watanabe, who leaves his hometown to go to school in Tokyo after his best friend, Kizuki, commits suicide. He becomes involved in a love triangle with Kizuki’s girlfriend as well as an alluring fellow student Midori. The student protests of the 1960s add an interesting historical backdrop for this romantic tale. Murakami is one of the most popular Japanese author’s worldwide so his works are definitely worth checking out and several are available from Hoopla as audiobooks including the short story collection Blind Willow, Sleeping Woman, whose title story includes characters from Norwegian Wood. Norwegian Wood the book is available in print from BCCLS libraries; this and the other movies I have mentioned are also available from BCCLS on DVD.